Salinity is an important factor affecting microalgal production yield especially under the uncontrollable environments of outdoor cultivation systems. Elucidating the optimal salinity range for algal biomass and high-value biochemical production might help to increase the production potential and reduce cultivation cost. 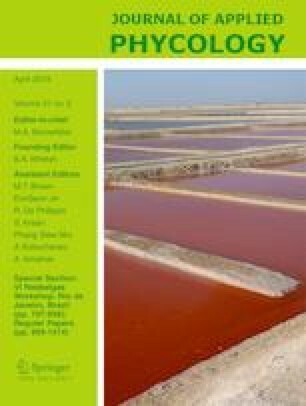 This study examined the effects of salinity changes from that of normal seawater level (30 ppt) to various salinities from 10 to 60 ppt on growth, biomass, photosynthesis, morphology, biochemical composition, fatty acid composition, and volumetric productivity of the marine microalga Tetraselmis suecica. The optimal salinity for biomass production of T. suecica was in the range from 20 to 60 ppt. Severe growth inhibition, alterations in cell morphology, and reduction of photosynthetic rate were found at low salinity of 10 ppt, suggesting that the algal cells suffered from osmotic and ionic imbalance. Total protein, carbohydrate, and lipid content were not significantly affected under the different salinities, although the increase in salinity from 30 to 50 and 60 ppt improved the total lipid productivity by nearly 22%. Fatty acid composition and content remained unchanged over the range of salinities. The predominant fatty acids were of C16 to C18 chain lengths, whereas eicosapentaenoic acid (EPA) was the major long-chain polyunsaturated fatty acid (LC-PUFA). Together these results demonstrate that a wide range of salinities are suitable for cultivation of in T. suecica without a compromise in biomass yield and biochemical composition. The online version of this article ( https://doi.org/10.1007/s10811-018-1619-7) contains supplementary material, which is available to authorized users. We are grateful to Assoc. Prof. Philip D. Round for his assistance in English proof-reading and editing the manuscript. This research was supported by PTT Research and Technology Institute, the Royal Golden Jubilee Ph.D. Program of Thailand (Thailand Research Fund), the Center of Excellence on Environmental Health and Toxicology, Science & Technology Postgraduate Education and Research Development Office (PERDO), and Ministry of Education, Thailand.